This time of year the sun rises in Stockholm around 9 a.m. and sets at about 3 p.m. The days are similarly brief in Copenhagen, Helsinki, and Oslo. Yet, for all the vitamin D deficiency, these northerners are smiley through December, and with varying success, into the winter. Meanwhile, despite having comparatively longer days, New York, as a whole, is complaining. This presents a compelling question: What is it that America’s cultural capital — and maybe the country more broadly — doesn’t get about winter and that seems so baked into Scandinavian life? Folklorists, historians, and anthropologists have a few ideas. If you feel like playing the role of scandalized American, walk into any restaurant, bar, or house from Berlin to the Arctic Circle during the winter. You will find candles arrayed across the room, unthinkably unshielded by glass or plastic. 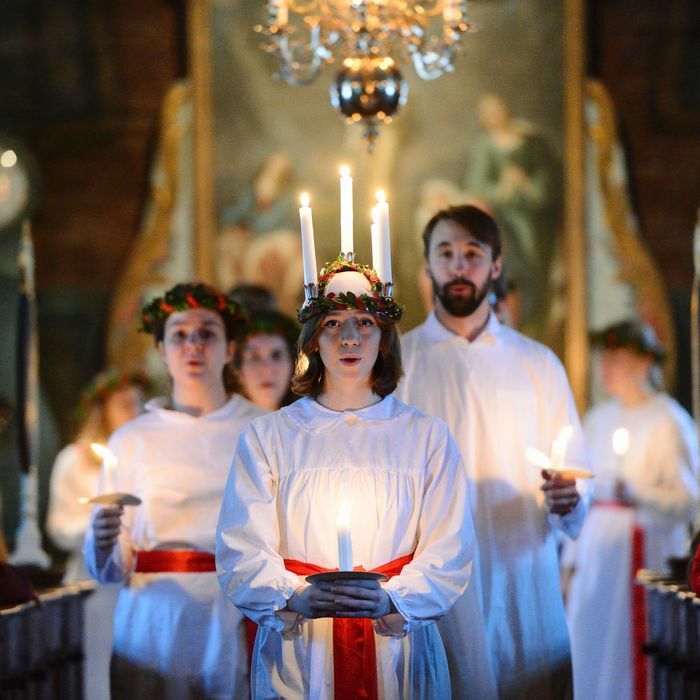 Marcus Cederström, who just completed his Ph.D. in Scandinavian studies at the University of Wisconsin, Madison, says that while candles are rightly romanticized today, their cultural primacy reflects their longtime role in survival. Befitting to the land of the Vikings, Scandinavian houses didn’t really have windows until the 17th century, and electricity didn’t come far into the countryside until into the 20th century. And Christmas is cultural, rather than religious. In the old days, the good times of Yules served an essential social function. With three long, hard, cold months ahead, no one wanted the burden of feeding all their cattle, so they slaughtered them. And with so much meat to go around, “You might as well have a blowout feast,” he says. That also allowed members of the family, clan, or broader community to come together and reestablish ties, ensuring that people could lean on their fellow villagers to get through the winter. Wool played a similar role to food. By the end of the fall, you’d have shorn your sheep of their coats and spun the wool into thread. The next step: you get together and knit. Communal knitting rooms were a center of wintry social life through the 19th century in Denmark, he says. It’s dark, you’ve got candles lit, you’re sharing food, throwing back some mead, and telling tales of the year that’s passed. Over in Finland, the beloved sauna has served a similar role for a couple thousand years, and Swedes copied it and called it the badstuga, or bath cabin. Beyond being a way to warm up, the stones and steam provide a setting to hang out with your friends and neighbors. Today, 99 percent of Finns visit the sauna at least once a week. You double down on coziness. Americans found a bit of an obsession with the cozy Danish concept of hygge over the past year. Trend stories abound, and there are now enough hygge-centric books on Amazon that you could form a reassuring pile on your nightstand. Like many a culture’s gifts to the world, there isn’t a direct translation: In his ethnographic study of the subject, anthropologist Jeppe Trolle Linnet declares that “the meaning of hygge can be approximated through English words such as cozy, homey, informal, sincere, down-to-earth, warm, close, convivial, relaxed, comfortable, snug, friendly, welcoming, and tranquil.” (The German Gemütlichkeit, or a state of good cheer, comes close, too.) It’s a way of existing just with the people that you’re around, quality time where you laugh about old memories and create new ones. To Linett, hygge is a “category of practices that, in various ways, entail the creation of temporary ‘shelters’ against social stratification, competition, and the market.” You create a sense of interiority, and stay within it. While recipes vary, it’s generally agreed hygge is a combination of ambiance and company. One gathers candles and other indirect lighting; seasonal beverages like glögg or its Germanic equivalent, glühwein; simple, warm furniture with clean lines. Equally as important: warm company where people don’t dominate the conversation; good, simple, clean food. There may also be a high likelihood of board games, and while hygge is largely an analog pursuit, I’ve heard that exceptions may be made for heartwarming films. For Tangherlini, the folklorist, the knitting circles of old formed a “wellspring” of what hygge is today: the felt quality of intimacy, shared memory, and protection from whatever storms — meteorological, political, or economic — may be happening outside your door.